The UAV Predator - Changing the Face of the Battlefield! The UAV Predator has forever changed the face of the battlefield by giving commanders across the globe real-time intelligence vital for making critical battlefield decisions that will protect our troops while defeating the enemy. It's the first UAV capable of capturing and sending live video across the world, day or night, regardless of how bad the weather may be! Armed with 2 laser-guided Hellfire missiles, the MQ-1 Predator can seek out and destroy enemy targets in a matter of seconds without putting the lives of our soldiers on the line. A UAV Predator "System" consist of 4 Aerial Vehicles, a ground control station (GCS), communication equipment, and operators of course. The Aerial vehicle is 27ft long with a wingspan of 55ft. Its rear-mounted variable pitch propeller powered by a Rotax 914 turbo engine can pull bird to a top speed of approximately 120 MPH. The Predator UAV can fly to a maximum altitude of 25,000ft. The endurance is amazing as this bird can fly up to 40 hours without landing! 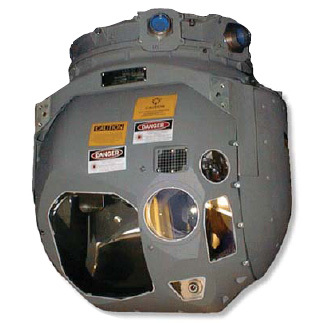 The RQ-1 Predator's Skyball Gimbal is equipped with two color video cameras, an infrared camera, and a synthetic aperture radar (SAR). The color camera on the nose is primarily used by the remote pilots to fly the aircraft. 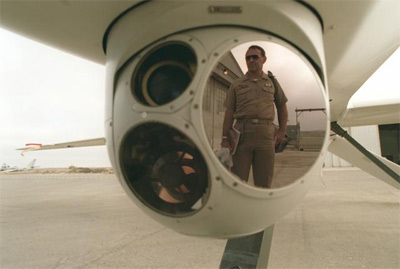 The second color camera is a variable aperture video camera that is used for surveillance and reconnaissance. The infrared camera is used when there is not enough light to use the color camera. If the weather is bad, both the color and infrared cameras are pretty much useless. You can run but you can't hide! The synthetic aperture radar (SAR) system allows the UAV Predator to see the enemy regardless of the weather conditions and can also see through dense smoke. The SAR is a very complex imagery system. The Skyball Gimbal is replaced with the Multi-Spectral Targeting System(MTS) on the armed MQ-1 version of the Predator. The MTS is upgraded with target acquisition capabilities. It gives the MQ-1 Predator the ability to paint targets for its own laser guides Hellfire missiles or designate targets for laser-guided missiles fired from other aircraft. The ground control station is basically a commercial trailer that houses the pilots and sensor operators. The ground control station has the ability to control up to four aerial vehicles at once! The aerial vehicles and their sensors are controlled by the GCS's C-Band line-of-site data link or by means of a Ku-Band satellite uplink vehicle. The C-Band line-of-site data link is basically a short range link that can control the aircraft as long as it's in visual site. The Ku-Band satellite link can control the aircraft from anywhere around the world! Are you wondering how these ground control stations are transported? Well, they're not exactly pulled around the world by an 18 wheeler! The GCS is easily rolled into the belly of a C-130 Hercules. The air vehicle itself is also transported by a C-130 after it's broken down and stuffed into a box called the "coffin". What's really cool about the Predator is its ability to fly completely autonomously. Simply put, the on-board navigational system gives the UAV Predator the ability to carry out missions all by itself, without anyone controlling it! 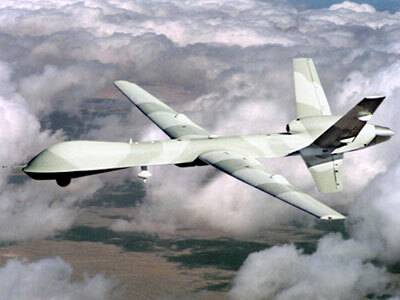 The Predator flies autonomously for simple missions such as surveillance over a specified plot of land. But most missions are controlled by remote pilots by either a line-of-site or satellite data link. Typically the launch-and-recovery team takes off and lands the Predator UAV under the control of a C-Band line of site data link. 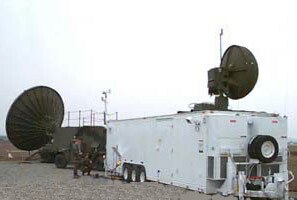 Once the aircraft is out of site, it is piloted via the Ku-Band satellite link. The satellite link is what makes it possible to control the aircraft from anywhere around the world! The launch-and-recovery team can maintain control over the vehicle via a local satellite uplink, but most often they pass the control of the aircraft and it's sensors over to operators at Nellis Air Force Base in Nevada. Who's Responsible for the Predator? U.S. Airforce 11th Reconnaissance Squadron, operating out of Nellis Airforce base in Nevada, was the first Squadron assigned to the Predator in 1995. The 15th and 17th Reconnaissance Squadrons, out of Creech Air Force Base in Nevada, were added in 1997 and 2002 respectively. The Predator is merely a snapshot of the evolution of UAV's. 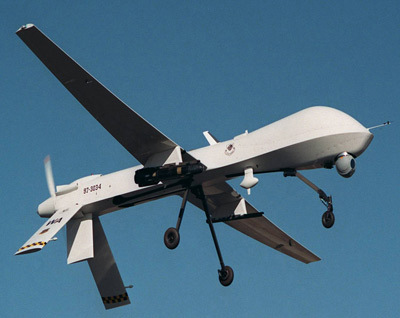 The Predator is a product of the technologies developed from past UAV's. It is also a foundation and stepping block for UAV's of the future. In 1984, the Defense Advanced Research Projects Agency (DARPA) contracted Leading Systems Incorporated (LSI) to build the Amber UAV. 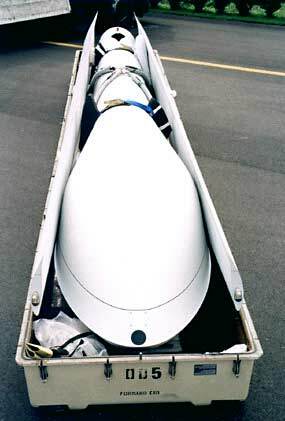 The Amber UAV flew for the first time in November of 1986. There were a total of seven Amber UAV's produced. LSI quickly began working on an improved version of the Amber, which is the Gnat 750. The first Gnat 750 took to the skies in 1989. General Atomics bought out LSI in 1990 and continued to develop the Gnat. In 1992, the Gnat 750 became the first UAV ever to be controlled via a satellite link! General Atomics used the technology developed and tested with the Amber and Gnat to develop the medium-altitude, long endurance(MALE) UAV knows as the Predator. The Predator's first flight took place in 1994. Originally designed for carrying out reconnaissance missions, it was first deployed in Bosnia in 1995. 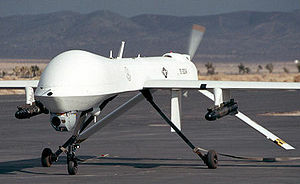 The military designated the original version of the Predator as the RQ-1. The "R" stands for reconnaissance. The "Q" means it's an unmanned aircraft system. And the "1" just means that it was the first system as its kind. In February of 2001, a Hellfire laser-guided missiles was fired from a Predator for the first time. Wow, a giant armed and dangerous RC airplane! The military designated the armed UAV Predator as the MQ-1 . It's the same as RG-1, except it carries munitions. The "M" stands for "multi-role". The MQ-1 Predator proved that the ability to find and destroy enemy targets remotely, without taking the time to scramble a fighter jet, is a huge tactical advantage! That's when a bigger and better Predator-B was developed, AKA "The MQ-9 Reaper". 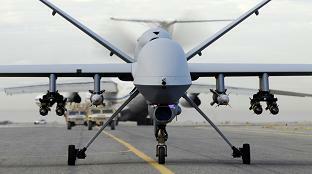 The Reaper can carry 15 times more weight and can fly three times faster than its predecessor. The Reaper was the first UAV specifically designed to carry munitions. It has been dubbed "The Hunter-Killer" UAV.